JMV is one of the leading company's engaged in manufacturing and supplying of Conventional Lightning Protection System. We offer lightning protection arrestors for electrical power systems, telecommunication, chimneys and structures in agricultural, commercial, industrial, institutional and residential areas at industry leading prices and within very less lead time. Lightning Arrester is a device used to protect the insulation and conductors of the system from the damaging effects of lightning. If lightning strikes it will preferentially strike the spike arrester, and be conducted harmlessly to ground through the wire, instead of passing through the building, where it could start a fire or cause electrocution. 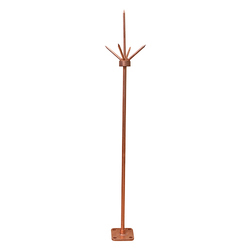 A Spike Lightning Protection Rod is a single component in a spike lightning protection system. In addition to rods placed at regular intervals on the highest portions of a structure, a conventional type lightning protection typically includes a rooftop network of conductors, multiple conductive paths from the roof to the ground, bonding connections to metallic objects within the structure and a grounding network. JMV has high manufacturing values and the name is trusted for its superior product quality delivering to our clients. To take forth this principle we keep improving our products and likewise with higher improvising standards we introduce Lead Coated Copper Lightning Arrester. The Lead Coated Copper Lightning Arresters are most suitable in adverse atmospheric conditions where the product is more prone to get deteriorate due to excessive heat and smoke. Lead Coating protects the arresters from corrosion resistance and melting of copper which results into better product life. This product carries an advantage of product longevity, low maintenance and is not sensitive to bad weather comprises with an applications. Looking for Lead Coated Copper Lightning Arrester ?